I’ve been through a fair share of wrist braces in my time with RSI. Wrist braces are often the first item you will obtain after seeing a physical therapist about an RSI condition. They can be a lot of help to a RSI sufferer, but have to be used correctly, comfortably, and should not be used if they worsen your RSI symptoms. There are a lot of braces out there, and what works for one person may not work for everyone. Braces are usually made out of neoprene or elasticated material coupled with a metal or hard plastic support to immobilise the wrist. The primary use of the wrist brace should not be forgotten ie to rest wrist joints and forearm muscles that drive the wrist motion (forearm extensors, flexors), and reduce the pain associated from overuse injuries. While this may sound like a good thing, quite often if you wear a brace while using a computer, you will end up using other muscles in a strenuous way to do the same work, and can cause other injuries because of this. There is no such thing as an ideal wrist brace, it really depends on what they are trying to do. In the course of your RSI journey you way well encounter many different styles of wrist braces. You shouldn’t jump in and buy a wrist brace without first seeking advice from a physiotherapist or doctor. Ideally, it should be used to rest (heal) the wrist and the overused (painful) muscles that drive the wrist extension and flexion, and not worn when using a keyboard or mouse. Exceptions to the rule are perhaps specific braces intended to stop excessive flexion of the wrist if you are prone to this. It’s a far better idea to be able to spot this flexion yourself and change it, but if you have difficulty doing this then a brace may be required. Alternatively have someone stand and watch over you with a big stick, you will learn faster then! Braces used to rest the wrist should not be too tight, just a snug fit. Over tightening can lead to restricted blood flow to the hand and wrists. 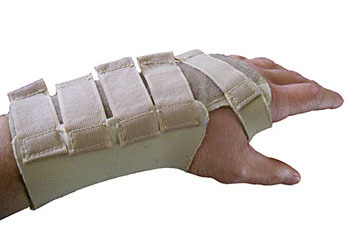 Consider wearing a wrist brace at night in bed to avoid sleeping with your arms/wrists/hands in bent positions. It is critical that you don’t have a tight brace when doing this so as not to restrict blood flow. Don’t use them unless you have to. Its better to know your pain, when it happens and try to make adjustments to your work practice etc to reduce the causes than it is to just ‘bandage up’ your injured wrists into a brace. Neoprene braces can be hot, sweaty, smelly and itchy to wear even for short periods of time. Better to look for ventilated elastic material ones. Wrist braces are not a good universal fit for everyone, so you may have to make some adjustments to it to make it comfortable, including cutting bits out of it or adding some customised padding. Wear them at work and they do flag to your employer and colleagues that you have a RSI problem! Remember though, wrist braces are not a solution to RSI, they are really only there to rest an injury and ease pain. To address your injury it is far better to try to make adjustments to your work to stop the motion that is causing you to have the pain. In other words, you should monitor your wrist, hand motions at a keyboard etc, and make adjustments to your bad working practices, including posture changes. You should also introduce more regular breaks away from your computer along with a good stretching routine and some physical activity. « Too young to be taught about RSI?